The European Central Bank’s plan to spur the economy with a massive bond-buying program will come to a halt in December as it decided on Thursday to keep interest rates flat through next summer. The decision to keep rates static came as the result of incoming data correlating with the ECB’s earlier economic forecasts. The ECB’s monthly bond purchase program was granted an extension through the final quarter of the year, but at a slower pace–a sign that the bond-buying would most likely come to a halt in December if the Eurozone economy remains robust. “The Governing Council expects the key ECB interest rates to remain at their present levels at least through the summer of 2019 and in any case for as long as necessary,” said the ECB in a statement. In early trading in the United States, Euro-focused ETFs responded on the up side to the news with Vanguard FTSE Europe ETF (NYSEArca: VGK) up 0.37%, iShares MSCI EMU ETF (NYSEArca: EZU) up 0.23%, WisdomTree Europe Hedged Equity Fund (NYSEArca: HEDJ) up 1.48%, SPDR EURO STOXX 50 ETF (NYSEArca: FEZ) up 0.44%, and iShares MSCI Germany ETF (NYSEArca: EWG) up 0.77%. 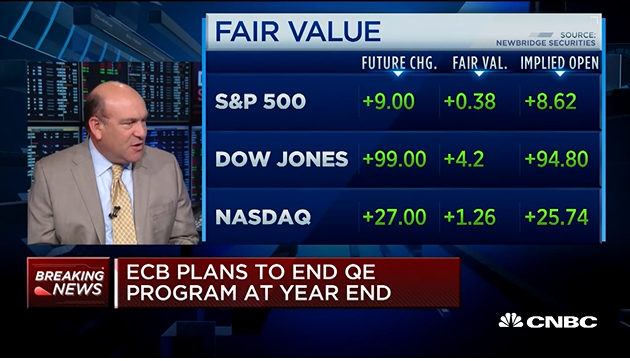 Prior to the announcement, the ECB’s original plan was to continue the bond-purchasing program until September with monthly purchases of 30 billion euros ($35 billion) that include a combination of government and private debt. The purchasing will now be scaled back to 15 billion euros in the final business quarter of 2018.